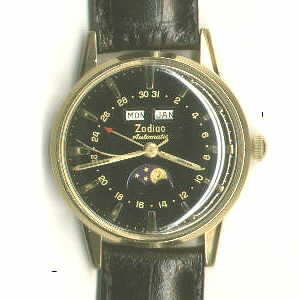 Beautiful automatic Zodiac triple date with phases of the moon. 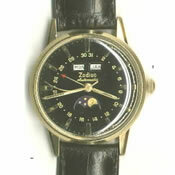 Zodiac signed case is yellow gold-plate with a stainless steel back. Measures 34mm; 42mm lug tip to lug tip. Case shows no wear though on gold-plate and only has a couple of minor blade scratches on the steel back. 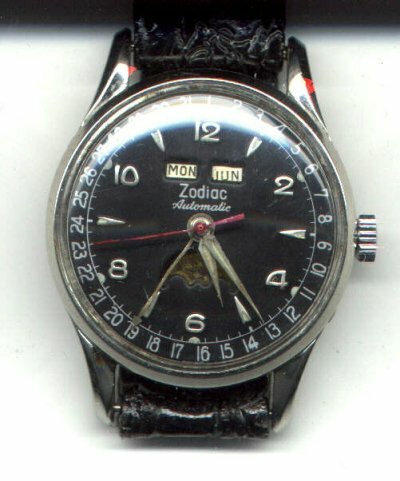 The 17 jewel automatic movement is signed Zodiac and is a full rotor automatic. 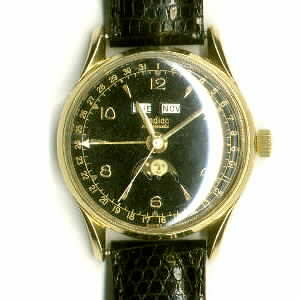 Dial is original, done in black with gold applied bar markers. 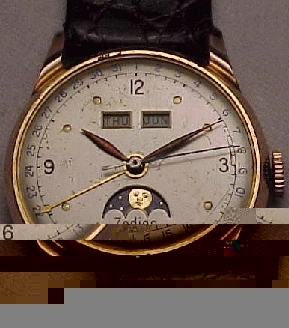 Apertures for the month and day below 12; aperture for phases of the moon above 6. 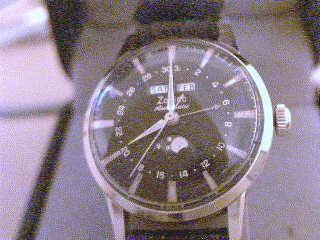 Dial is calibrated for date inside of the hour markers. 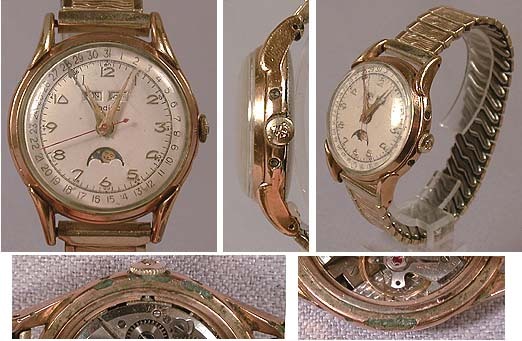 Hands and sweep seconds are gold in color and the date pointed is red tipped. Condition of dial is flawless. 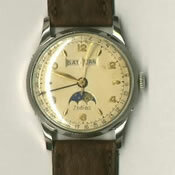 - Sold for $420.00. 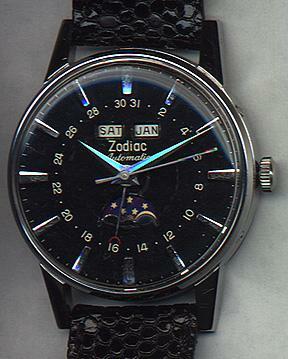 Zodiac moonphase Stainless Steel Near Mint Condition, Black Dial, Silver Hands and Markers, Automatic, Day, Month, Date, 34mm Round Case - Sold for $585.00. 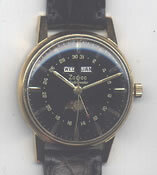 THIS WATCH HAS A S/S BACK,YELLOW GOLD PLATE(40MICRONS)TOP,HAS A FEW SCRATCHES ON ONE LUG BUT NOT BAD IN EXCELLENT COND.,GOLD HANDS,MARKERS,AUTOMATIC MOVMT.,DATE,DAY,MONTH, FUNCTION ALL WORK PERFECT,AND KEEPS EXCELT. TIME.THE CASE IS 34MM ROUND A VERY NICE DRESS WATCH, Went to $340.00 and did not sell. 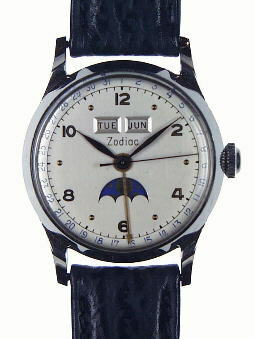 Nice Zodiac "Triple Date" with moonphase from the 50`ies, manual wind, stainless steel back, snap back, very good condition. Went to $480.00 and did not sell. 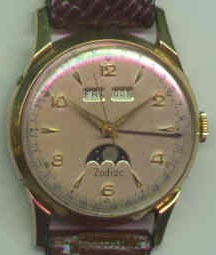 Zodiac Triple Date moonphase Automatic Gold Filled Top, Stainless Steel Back, Near Mint Condition, Black Dial, Gold Hands and Numbers, White Sweep Second Hand, Day and Month at the 12:00 Position, Date on outer Dial, 34mm Round case, there is a small tool mark on back of case, everything else is great!!!! 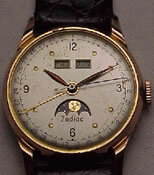 VERY DESIRABLE MOONPHASE TRIPLE-DATE BY ZODIAC. DIAL AND HANDS ARE ORIGINAL. 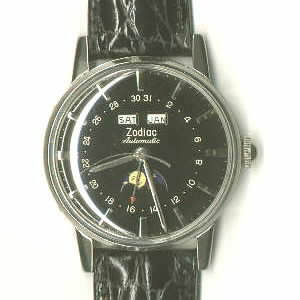 THE CASE IS SIGNED ZODIAC AND IS STAINLESS STEEL [SNAPBACK]. 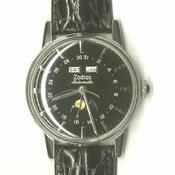 ALL FUNCTIONS OPERATE PROPERLY AND THE WATCH KEEPS EXCELLENT TIME. 42MM FROM LUG-TO-LUG. 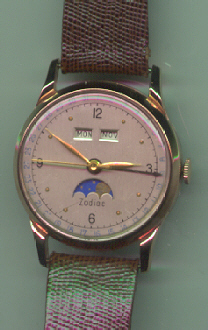 THE MOVEMENT IS A FULL ROTOR AND SIGNED ZODIAC. 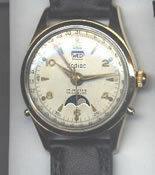 THIS IS A VERY SHARP MOONPHASE IN EXCELLENT CONDITION AND IS PARTICULAR NICE IN STAINLESS STEEL WITH AN AUTOMATIC MOVEMENT.